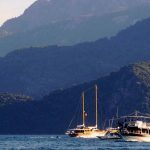 Every single summer, Marmaris becomes one of the most frequently visited destinations of travellers from the four corners of the earth. Marmaris is one of the most popular touristic sports of Turkey which is hidden behind the high hills of Aegean area. You will be petrified with astonishment when you see Marmaris from the top of the hill where you need to drive by for the first time. This view is so amazing that will cause you to stop your car (if you’re travelling by your private car) to enjoy this rare view for a while and take some unique pictures. We should warn you; while you’re in Marmaris, you won’t want to spend any time by doing nothing. You can easily fill each of your days by different attractions and excursions while you’re saving some energy to the long and lively nigh ahead of you. Nightlife in Marmaris goes on non-stop and vivaciously goes on in numerous pubs, bars and night clubs having said that, the most famous ones are coexisted in one street. We would like to present proudly: Marmaris Bar Street. This is a narrow street where you can easily access from the centre with a short walk and find amazing bars and clubs placed row after row. If you’re kind of a night owl in a manner of speaking; we advise you to pop in multiple places as every bar offers different type of music, ambiance and special drinks! Club Areena: The biggest open air night club in Marmaris. Open from 21.30pm till 4am. CCCP: One of the most famous bar of Marmaris where everyone(+18) is welcome inside and offered first class music and drinks all night long. Joy Club: Perfect night club for those who want to have unlimited fun with some well-chosen quality vibes. B-52: Great place where you can dance till the wee small hours while sipping various cocktails prepared by experienced bartenders. Crazy Daisy Bar & Nightclub: One of the biggest night clubs in Marmaris with its capacity for 1,300 clubbers. One of the most frequent destinations of both tourists and locals also because of having a wide terrace outside. You can have fun at here till 4am. Andromeda Disco: With seating areas in the balcony and uniquely designed bamboo furniture, serves first class music to its visitors every night till morning. Rock Bar Marmaris: Rock music fans, here! Besides live rock / alternative music, Rock Bar Marmaris offers special events and parties frequently. We must say, checking out articles and blog posts where you’re planning to go for the first time is a good option to have an opinion about the place for sure. However, we square the circle hereby by trying to explain you the feeling you would have in the Bar Street of Marmaris.